The Gaviota Hot Springs was my destination. I have wanted to paint there for a long time. It was a beautiful day so I decided to go on a drive. I got to Gaviota Hot Springs at midday. It was a bit of a hike up a steep muddy trail and I was winded by the time I got to the springs. (Note to self; get some exercise dude!) There were two gray-headed gentleman sitting in the pool when I arrived there who had already been there for a couple hours. After a short chat I joined them. The temp was not hot at all, in fact it was luke warm. Around 80 degrees. Bubbling up from volcanic activity was the distinct odor of sulfur. The minerals are said to heal. So, I stayed in and talked about Costa Rica, art, snakes and vanilla beans for about half an hour and noticed that the sun was about gone from the canyon. I wanted to get a painting in before I went home, so I hopped out and dried off. When I got dressed again, I headed back down the mountain. 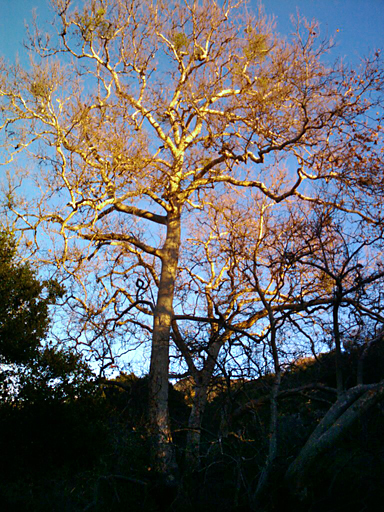 When I got to the trail-head by the parking lot, I looked back up the hill and this magnificent tree was waving goodbye to me and the sun as it went down. I got in the car and headed south on Highway 101. While watching the sun go down, I knew it would soon be completely gone. I was compelled to do something about it before ASAP. I stopped the car and ran out to the top of the cliffs above Gaviota State Beach to capture the last of the sun before going behind the horizon. So, there I was painting… and the quick 20-minute study you see here was sold right off the easel from a guy that saw me painting from below. He approached me and wanted it so… SOLD! I guess timing is everything, right!? Anthony is here from Salt Lake City and visiting some friends along the coast. 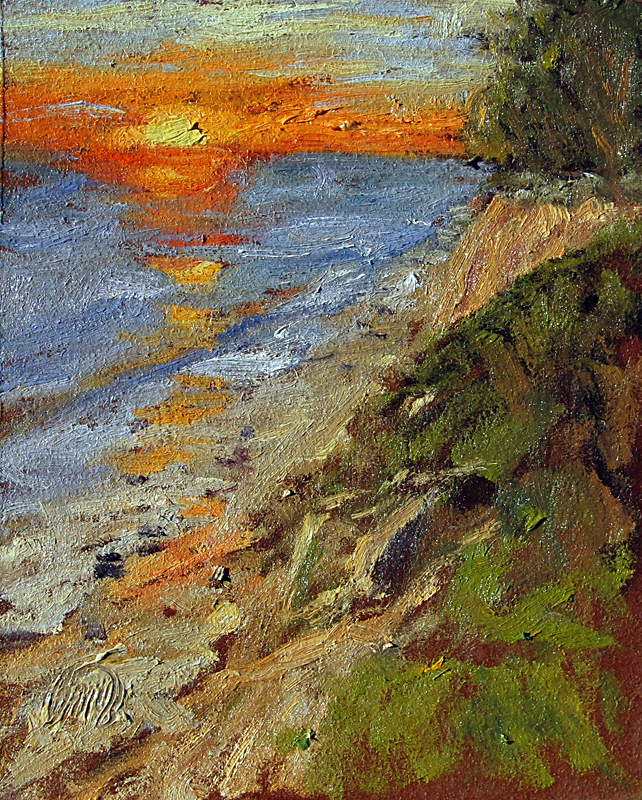 He told me that this painting would be a reminder of his dad whose final resting place is just about where the sun is setting there… near Prince Island in San Miguel island’s Cuyler Harbor. I was happy to have sold this to someone so spontaneously, but the bummer was since it was dark when I finished it, I had no photo. Luckily, he was heading from Santa Barbara to Orange County so I had a chance to take the shot when he stopped by my studio this morning. Lovely. What a wonderful gift for the man who bought your quick study. It will be a treasure. I heard about this from Diana who was at a meeting with me today. I’m sure this guy will enjoy it for a long time!